Last year, I wrote a post for Molly Greene's excellent blog detailing print and distribution options for self-published authors. Since then new options have emerged: boutique distributors such as Small Press United, for example, now work with self-publishers. Still, for most authors, Createspace, Amazon's DIY self-publishing platform, and Lightning Source, the resource used by major publishing companies, remain the most popular options. Both Createspace and Lightning Source provide print, distribution, and digital fulfillment services. Createspace and Lightning Source are both reputable companies that produce library-quality books using a Print on Demand (POD) model -- i.e., books are printed and shipped to fulfill customer orders. While some services overlap, each company has its strengths and weaknesses. Which is preferable depends largely on the needs and objectives of the author. The information below should help you decide which service would be better for you. Createspace and Lightning Source produce library-quality paperback books from files you upload yourself. If your file is perfect, your book will be perfect. If not, well, that's why God created revisable proofs. Both Createspace and Lightning Source produce small and large paperback books in standards sizes, meaning your printed paperback books look exactly the same as books published by major publishers. For authors who wish to publish an off-size book, Lightning Source offers a greater variety of trim sizes. Createspace prints only books with laminated covers. The laminate finish is beautiful and, for many authors, optimal. Lightning Source gives authors the option of printing a cover with a laminate or matte finish. A matte finish, typically used by major publishers for their literary titles, is sometimes perceived as weightier or more serious. Both companies print paperback books. Lightning Source prints both paperback and hard cover books, an option Createspace does not offer. Createspace offers a range reasonably priced author services with a la carte options for everything from book design to marketing. For first-time self-publishers working with a professional design and marketing team can make a daunting process easy and pain free. Once you've uploaded your paperback file, you simply hit a button and Createspace will create a digital file and upload to Amazon Kindle. A file produced by an outside designer can be uploaded in a matter of minutes. The proof can be reviewed digitally (on the Createspace site) or ordered as a physical book. Book proofs arrive within a few days, and within 24 hours of approving the proof your book will appear on the Amazon shelf. If you have a problem at any point in the process, Createspace customer service representatives are responsive, efficient, and easy to reach. Lightning Source offers only print, distribution and fulfillment services. They offer no design or peripheral author services. Files must be fully designed before uploading to the site. While not particularly difficult, the Lightning Source website is harder to navigate and less robust than the Createspace site. Once the book is uploaded, it can take several days to a week before the file is ready to be proofed. And then it takes another week to appear in distribution channels, making the lag time between uploading and point of sale substantially longer. Customer service is also minimal. If you encounter a problem uploading your files, filling out metadata, ordering or approving proofs and so on, you're more or less on your own. 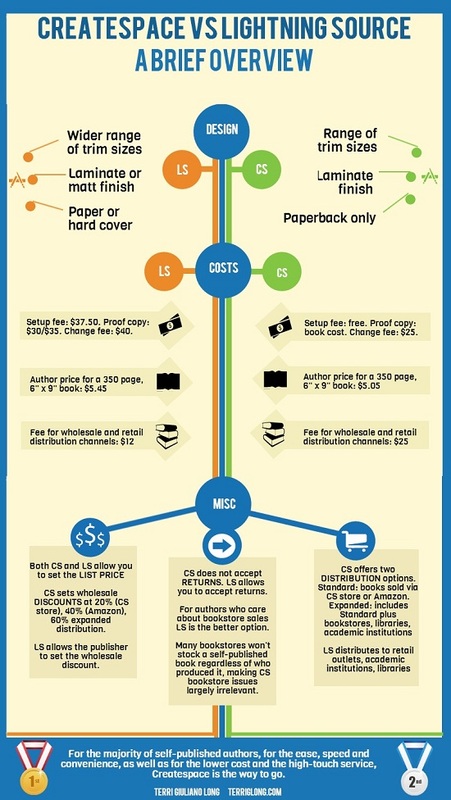 When it comes to cost, Createspace has the clear advantage. Createspace charges no setup fee and proofs cost the same as the price for an individual book; changes to a title cost $25 per change. For books uploaded digitally, Lightning Source charges $37.50 for setup, $75 if you opt to use the scanner. Lightning Source paperback proofs cost $30, hardback $35, and revisions cost $40 a pop. Again, Createspace offers the better bargain. According to their site they offer the lowest author costs in the business. Both companies calculate price based on trim size and page number. For a 6" x 9" book, 350 pages, the author's cost via Createspace would be $5.05. The same size book from Lightning Source would cost $5.45. With both Createspace and Lightning Source the author sets his or her own list price. The list price is your suggested retail price. Retailers often offer discounts, so your list or suggested retail price is not necessarily the price readers will pay for your book. Authors should give serious consideration to pricing, taking into account their bottom line -- cost and list price factor into profits -- as well as the effect the list price might have on sales. Pricing a book too low may invite negative perceptions about quality. Pricing too high may negatively affect sales, with buyers less likely to try an expensively priced book by a new or unfamiliar author. To calculate royalties, from list price subtract your wholesale discount and then subtract print costs. Createspace sets wholesale discounts at 20 percent for the Createspace store, 40 percent for Amazon, and 60 percent for expanded distribution. For a 6" x 9", 350-page book, assuming a retail price of $14.95, you'd receive $6.91 in royalties for sales in the Createspace store, $3.93 for sales on Amazon, and 91 cents for sales via expanded distribution. With Lightning Source, the publisher sets the wholesale discount. If you offer a 50 percent discount, assuming the same $14.95 retail price and $5.45 per book cost, your net profit or royalty would be $2.025 per book. For more information on wholesale discounts, see below. Createspace and Lightning Source use modern print on demand (POD) technology. In addition to POD, Lightning Source offers the option of short digital (50+) or offset print runs (1,500 is the typical minimum order for offset printing). Createspace offers no such option. In the old days, POD books were considered an inferior product. Covers tended to be shoddy, the paper thin, and the print quality poor. Today, both self- and traditional publishers use POD technology for books they don't intend to warehouse. To the untrained eyed, POD books are nearly indistinguishable from those printed on a press. Offset printing offers two major advantages: flexibility and price. Books printed on an offset press are highly customizable, with options for trim size, paper, and color. The unit cost for books printed in a run is also lower, with the unit discount rising as the quantity rises. A 350-page book printed on demand costs approximately $5. Printed as part of a 250-book print run, the cost drops to about $4.50. For larger runs, the price drops even more. For a detailed breakdown, take a look at the Createspace community message board. The upfront cost for books printed via the Createspace or Lightning Source POD service is minimal. The author pays a small setup fee (with Createspace there is no fee), a fee for the proof, plus a moderate unit price. The total cash layout to print, proof, and buy a book from Createspace is under $50. Assuming a 250-book print run (discounts on shorter runs may not justify the cash layout), a publisher is looking at over $1000--plus shipping charges, which can be hefty, particularly if books are shipped a long distance or drop-shipped to different locations. If the title will be sold via a distribution service (as opposed to stored and shipped from the author's home), the publisher also pays warehousing and distribution charges. These costs add up and can amount to a significant outlay, especially for an author working on a tighter budget. For self-publishers who can afford it, it may make sense to purchase a short run of 100-250 books to keep on hand for signings, contests, giveaways, promotions, website sales, and bookstore consignment. Both Createspace and Lightning Source use major distributors such as Ingram and Baker & Taylor to distribute to bookstores, academic institutions and libraries. The distributor lists available books in their catalogue and/or online database, and buyers use the database to purchase through distribution chains. Once you've set up your distribution channel, within about 4 - 6 weeks (possibly sooner) your book will be available for order. This does not mean that schools, libraries or bookstores will buy or stock your book. Publishers, particularly the big guns, have in-house sales teams that call on booksellers and talk up the publisher's offerings. With limited shelf space, buyers are far more likely to order a book they're familiar with--and their customers have heard of--than a title by an unknown indie author. Createspace offers two distribution options: standard, meaning books will be sold on Amazon or via the CS store or expanded distribution, which includes bookstores, libraries, and academic institutions. All books published via Createspace are offered to CS and Amazon; authors may choose to add expanded distribution. Lightning Source distributes to all retail outlets, academic institutions, and libraries. With Lightning Source it's an all or nothing proposition, meaning you cannot opt out of any particular distribution channel. For Createspace, distribution to Amazon and the Createspace store are free. Expanded distribution to bookstores, libraries, and academic institutions costs $25 per title. Lightning Source charges $12 per title for worldwide wholesale and retail distribution channels. Amazon royalties are higher on books distributed via Createspace (see above). For self-publishers, because most indie authors sell 90% or more of their books on Amazon, this matters. Distributing exclusively via Lightning Source can lower paperback royalties considerably. While bookstores are usually happy to fulfill specific customer orders, most bookstore owners refuse to buy books from Amazon, Amazon imprints, or Amazon affiliates such as Createspace. Even if your digital book hits the bestseller lists, if you distribute your paperback through Createspace many bookstores won't stock it. With Lightning Source there are no such issues. This is the reason some authors use Lightning Source. One way around this problem is to use Createspace for Amazon/Createspace distribution only. Amazon prefers Createspace and will purchase books from their publishing partner whenever possible. Use Lightning Source to distribute to bookstores, institutions, and libraries. This does increase work and add expense; for some authors, particularly if they don't anticipate tremendous sales numbers, the hassle and expense may not be worthwhile. With Createspace you may use your own ISBN only for books you sell through the Createspace store or to Amazon. If you sell through the Createspace expanded distribution channels--to libraries, institutions or bookstores--you must use a Createspace ISBN. With Lightning Source you always use your own ISBN number. As long as only one ISBN number is associated with your book, you should have no problem either way. The decision is important, though. Again, for their expanded distribution channels Createspace requires you to use their ISBN. If you go this route, then later decide to make a bookstore push and distribute via Lightning Source, you'll need to purchase your own ISBN number (you cannot use a Createspace ISBN for Lightning Source distribution). Once your book has two ISBN numbers, things get messy. In online bookstores, a title with two ISBN numbers will have two product pages -- a page for each ISBN. Sales are tracked by ISBN. Say two customers order the same book but from different product pages: one sale will be attributed to each ISBN. Suppose you sell 500 books a day. Depending on the day, 500 sales could get your book into the top 100 on Amazon. But suppose 200 customers bought from one product page and 300 from another -- one ISBN will record 200 sales, the other 300, and the title will be ranked accordingly. Under one ISBN your book may be ranked # 500, on the other # 1000. With two ISBNs there is no way to merge sales numbers, so your book will never appear to be selling as well as it really is. If you want to distribute via Createspace (for Amazon) and Lightning Source (for bookstores, academic institutions and libraries), the only way around this issue is to use one ISBN for both. Use Createspace only for Amazon distribution and list under your own ISBN and use Lightning Source for expanded distribution. Note: Your ISBN is separate from your copyright. You retain all rights to your work, whether you use your own ISBN or an ISBN issued by Createspace. The wholesale discount is the percentage of your retail price that you offer distributors (Baker & Taylor) and retailers (chains and independent bookstores). Here, Dog Ear Press explains wholesale discounts and what they mean to you, the author. Createspace sets the discount for you. Lightning Sources allows authors to set their own discount rates. Essentially, the higher the discount you offer, the greater the incentive for bookstores to carry your book -- and the less money you make. To raise their royalties, some authors raise their retail price. If your book is too much higher than others in your genre, however, you risk pricing yourself out of the market. It may make the most sense to offer a lower discount and price your title reasonably, using the list price for similar books published by the Big 6 as a guideline. Returns are among the more frustrating aspects of publishing. If a store orders a book and it doesn't sell, most publishers allow the store to return it for a refund. This policy gives stores an incentive to order a new title or a book by an unfamiliar author. Because most stores operate on narrow margins, the ability return unsold books is important to stores. Without that option, the chances of a store stocking an indie book are slim to none. Createspace does not accept returns. If a store or library orders from Createspace and the book does badly, they have no recourse. According a Createspace representative, the company does this to protect their authors. With Lightning Source, when a book is returned, any royalty you received is deducted from your monthly payment. Although the chances of this happening are slim, a high number of returns could get costly. Lightning Source gives authors the option of offering returns. This is optional, however; you don't have to offer returns. Createspace and Lightning Source are reputable companies that put out quality products, offer valuable services, and serve authors well. Currently, few bookstores stock self-published books. With high quality self-published books regularly hitting bestseller lists, this is rapidly changing. Until Createspace and bookstores kiss and make up, until they figure out a way to work together, for authors who care about bookstore sales Lightning Source is the better option. Realistically, at least for the time being, most bookstores won't stock a self-published book regardless of who produced or distributed it, so Createspace-bookstore issues are largely irrelevant. Self-published authors who wish to sell books in brick and mortar stores have the option of establishing a relationship and working directly with the owner or manager. Some authors offer their book on consignment. Others stock their own books and sell directly to stores, eliminating the need for large-scale bookstore distribution altogether. For the majority of self-published authors, for the ease, speed and convenience, as well as for the lower cost and the high-touch service, Createspace is the way to go.